honoured to have the support of Dame Eileen Atkins at our next fundraiser. Cranford, Cold Mountain & Gosford Park. We are delighted to announce that this year’s fundraiser will be supported by Dame Sián Phillips. Please join us for this very special evening, to hear the Golden Globe and BAFTA award-winning actress talk about her glittering life and career. Film and TV includes: Goodbye, Mr. Chips, I, Claudius, Tinker, Tailor, Soldier, Spy, Nijinsky & Clash Of The Titans. West End: Marlene, A Little Night Music, Pal Joey & Gigi. Drinks and canapés will be served beforehand, followed by a short reception with Dame Siân. All proceeds from the event will go towards the next Simple8 Season. 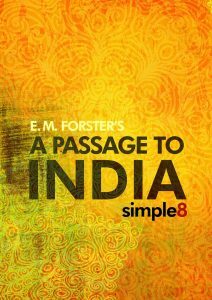 We’re delighted to announce a new collaboration with Royal & Derngate, reimagining Forster’s classic novel, A Passage To India. Stay tuned for more details! Thank you to everyone who came to see Don’t Sleep There Are Snakes. We had a tremendous turnout and response from critics and fans alike. Please stay tuned right here for more news, when we announce our new season in the autumn. With Don’t Sleep There Are Snakes about to open we have a chat with Seb and Chris about how rehearsals have gone.